Many rely upon the diverse experience of our team to tackle a wide-range of Environmental related projects in our region. There are few engineering firms in the region that have the combined expertise to solve design the right solution that is needed. You can trust us to design it right the first time. Brooks Engineering Associates is among the top design/permitting firms for on-site water systems in North Carolina and South Carolina. We are intimately familiar with both state’s regulatory requirements, which allows us to easily find the right solution for your site. We have extensive experience with large on-site wastewater systems, utilizing a wide range of pre-treatment systems and innovative disposal types. Including lagoons spray irrigation, drip irrigation, submerged membrane, and others. 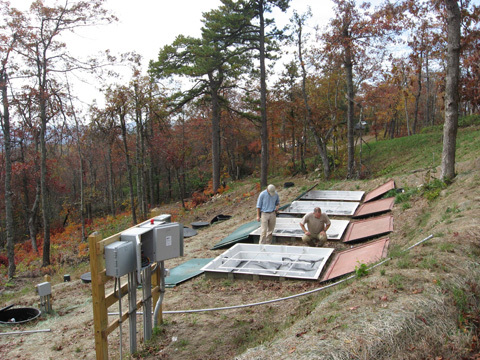 Our environmental professionals have wide-ranging experience working throughout the Carolinas. Your assessment will benefit from our extensive fate and transport modeling experience to accurately identify the correct and economical remediation solutions. We own and operate our own custom-designed Mobile Remediation Unit, permitted for use throughout the Carolinas to tackle diverse range of needs. We have helped various industry types with Spill Prevention Control & Countermeasure (SPCC) Plans as well as Stormwater Pollution Prevention Plans (SWPPP). Brooks Engineering Associates also has extensive experience with industrial waste management and industrial wastewater treatment systems. We regularly provide realistic due diligence with pre-buy screenings and/or assessment for property transfer transactions.